One of the most important things I learned growing up on the farm is that it is a way of life and thus a business (even if it is a small family farm). I think this one of the best lessons we can teach our children. I’ve visited several sustainable organic farms in South America and have heard from more than one of them that every thing that lived on the farm had to have a job or it was gone. The chickens gave eggs and fertilizer. The cows milk and pasture aeration. The dogs are guardians. In businesses you don’t keep employees around that don’t produce. And on the farm it is the same way. We had this lesson at the farm this week. We had 3 ewe lambs this year that just didn’t fit into the breeding program I am developing in the flock. Since they wouldn’t be “workers” it was time for them to move on from the farm. Normally this wouldn’t be too hard to do, but these three ewes were special to two special little girls. 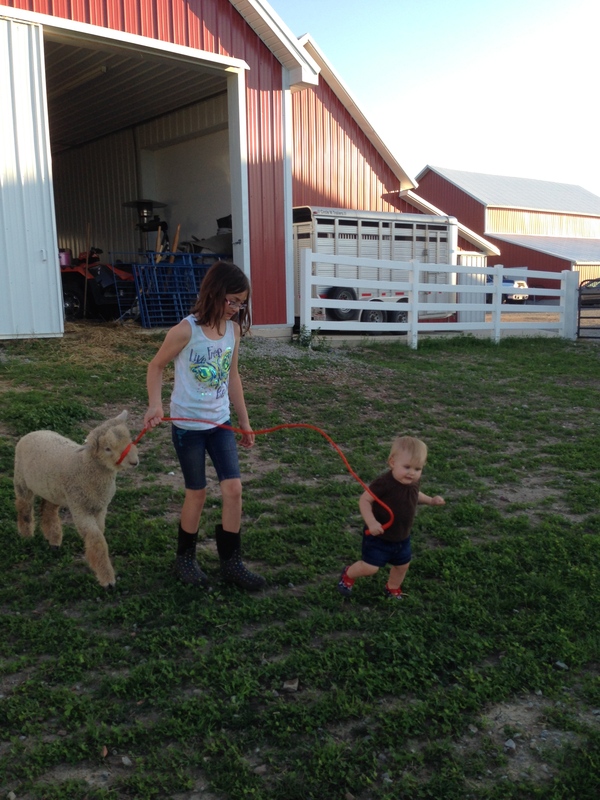 We worked with a friend’s daughter this spring/summer to help her in her first year of 4-H showing lambs. Salt, Pepper and Shaker became her girls. She walked them almost every night (with Harlie’s help of course), and showed them at the county fair. Again they weren’t the “show” quality we wanted but were a good first year project for her. So when we decided they needed to go it reminded me the lessons we all have to learn. It was hard to tell this little girl that her “friends” have to make their way on the farm or we have to find them a new home. Kids in 4-H and FFA (and on farms period) learn this lesson every year. They raise livestock that they form relationships with and then have to say goodbye. It might seem like a mean lesson for children, but truly doesn’t it prepare them for life? At some point, unfortunately, we have to say goodbye to everyone we love in our lives. For Salt, Pepper and Shaker that time was now. ← Thank a farmer today!